Most houses are under-insulated by today’s standards, and the majority are not properly sealed, a condition that allows heated or cooled air to escape. The U.S. Department of Energy says that homeowners can lower their heating and cooling costs by as much as 20% after their homes are sealed and insulated properly. We can help! 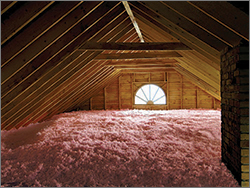 Pallett now offers expert advice and professional installation of the latest energy-saving insulation products, with a special focus on attics and crawl spaces.